Top: Fresh, whipped cream with Splenda and a strawberry make a light and quick dessert. Top right: Dip the top of your bowl in a low-carbohydrate chocolate glaze for a quick and flavorful bowl for yogurt, pudding or custard. Shred chocolate over the top to finish. 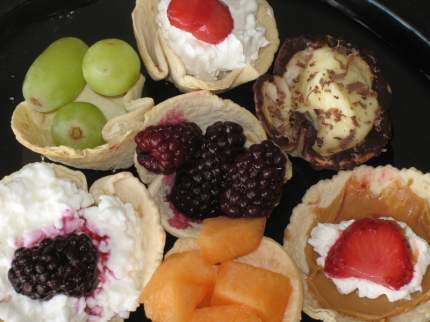 Right middle:Peanut butter and jelly with a twist: Stay out of a jam, and top your thin-spread peanut butter instead with fresh, whipped cream and a strawberry. Lower left of top picture: Cheese please. Cottage cheese topped with a berry brings sweet and cool to a refreshing lunch. The only thing more fun than eating these sweet and savory treats is making them! The consistency is like a thin pie crust, and this is a great accompaniment to savory or sweet dishes– and even alone! Packed in Bento lunches, made into tarts or mini pumpkin pies, or as a classy way to present guacamole and salsa with your taco salad or fajitas, give these a try and you’ll never look at those tortillas the same way again! For large bowls: Cut tortillas using 4″ circles (roughly half the diameter or slightly more) to make 2 bowls per tortilla. Press into a regular-sized non-stick cupcake pan or pre-spray regular pans with nonstick spray. Bake for 10-15 minutes or until set. Remove from oven and let rest until cool. These can be made and stored in a loose plastic sack at room temperature. Notes: These are not gluten-free. What to do with the leftover tortilla bits? The excess snippings can be cut into strips and fried as a crunchy topping for your taco salad! You can also fry them, and then sprinkle with Splenda and cinnamon for a low-carb dessert. You have such great little ideas 🙂 Thank you! These little cups are ADORABLE! Perhaps in a bento? Wink, wink.